From our three hospital campuses to our health centers, urgent care and pediatric practices, Texas Children’s continues to make great strides in improving access to our patients and their families. As part of Patient Access 2.0, Texas Children’s launched online scheduling in both English and Spanish on November 12 that allows current patients, new patients and referred patients to schedule appointments via DocASAP, Texas Children’s online scheduling partner. Texas Children’s is the only hospital of the top five on the U.S. News & World Report Honor Roll to offer online scheduling to patients. Texas Children’s patients can access the online scheduling button on Texas Children’s homepage. 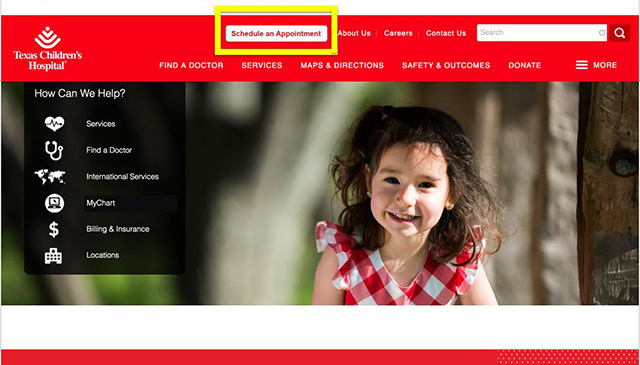 Once the button is clicked from the homepage, patients land on the new texaschildrens.org/appointment page and can view all scheduling options available: online scheduling, MyChart or calling the Customer Contact Care Center. Patients can also access online scheduling directly from provider profiles and department pages. From there, a scheduling widget will appear where patients and their families can schedule appointments online with a provider. This project would not have been possible without the collaboration from multiple departments including Information Services, Marketing, Patient Experience, Central Scheduling, Revenue Cycle and HIM. Practice administrators, ambulatory directors and community leaders also devoted time, energy and expertise in this project. In addition to the online scheduling option via DocASAP, patients who sign up for MyChart can schedule their appointments through the MyChart online patient portal. Since implementing direct scheduling via MyChart in March of this year, over 2,000 appointments have been made across the hospital system. Click here to access the FAQ for online scheduling via DocASAP. Since the March 2018 launch of the Patient Access initiative, Texas Children’s has implemented several solutions to improve patient access across the organization. Click here to watch this video.